paul, something I dont understand in your design - you seem to connect pin 1 (the i2c address) to both high AND low, and both resistors seem to be populated in the photos. you mention wanting to be able to configure i2c address - I guess you've just got a divider and can choose which way up it goes? whereas I tied both address pins straight to ground. do you think this could be the source of my woes? its a bit odd, as the i2c side of things works fine but.... I dont think I fully understand why a divider is needed on these pins at all? just trying to flush out all differences between the designs. Yeah, those resistors are redundant and unnecessary. The 150 ohm resistor could just be a short, and the 100K is totally unnecessary. The way I do these sorts of boards, managing the 2 week wait from OSH Park while juggle lots of other stuff for Teensy, I tend label all the part values when I design the board and then it's "out of sight, out of mind". Two weeks later, when I or someone else actually solders the board (really can't recall if I soldered this one, or if Erin or Brian did it), I don't bother looking at these sorts of things again if the board "just works", as this one did. Of course it didn't immediately spring the life... I had to write the TDM code. But fortunate the hardware worked on the first try. If you want to do exact the same as I did, populate both resistors. But there wasn't any reason to use both, other than I wanted the board to be configurable, and when the boards actually arrived the configuration stuff was forgotten and the boards built from the docs I made when I created the layout. you're a more thorough man than I. while I wait for the oshpark board, I have done the filthy thing and patched a bodge wire from VQ to a spare teensy pin, which I found that a brief 10us high output is enough to kick the codec into normal operation. I feel bad that I dont know why it doesn't work without it, and know that this is definitely not what the chip designers intended, but... at least I can move on and test the rest of the circuit (the bodge cap in the picture was me replacing an SMT 4.7uf with various other sizes, to see if it helped. it didnt). oh well... onwards! is there a way to fully disable a pin? fantastic, thanks for prompt reply. I had checked https://www.pjrc.com/teensy/pins.html and misunderstood. cheers! [...] - I've moved to an OLED SPI display (but one without a noisy boost converter! avoid the adafruit ones for audio work unless you have really good power supply) . Sorry, slightly OT: Mind to share - Which OLED is that, mmalex? Ah, thanks! Figured so, but was looking at the 128x64 version which looked too big. 102x64 ... didn't know that was a thing! And one OT follow-up, if I may (sorry, just was working backwards through the thread): You mentioned you had 2x AD5668 DACs working with SPI/DMA. Would you consider sharing the relevant code snippets? I've been trying, but failing, to get a multichannel DAC working via DMA. You mentioned you had 2x AD5668 DACs working with SPI/DMA. Would you consider sharing the relevant code snippets? I've been trying, but failing, to get a multichannel DAC working via DMA. sure! I pasted together the code, sorry if I missed a definition in the pasting process. i've added some comments too. Cool, thanks. This did the trick ... Getting output on all 8 channels now, I guess I must have done something wrong when stuffing the buffer. Now on to trying to hook things up to the PDB / audio library. FWIW, here's an .ino-version of mmalex's code above for just one 8-channel DAC (TI DAC8568 in this case. Turns out the input register is almost identical to AD5668). NB: using pin 7 for MOSI. Last edited by ubiubu; 08-15-2018 at 04:18 PM. with a single (evil) bodge wire, everything seems to work. plus, ive built 2 copies! code atm is just: 10 sine oscs out, and 10 ins graphed on a 'scope'. buttons, leds, encoders all fine. omg. next step - write some audio dsp? the teensy has been amazing to work with. the cs42448, not so much. 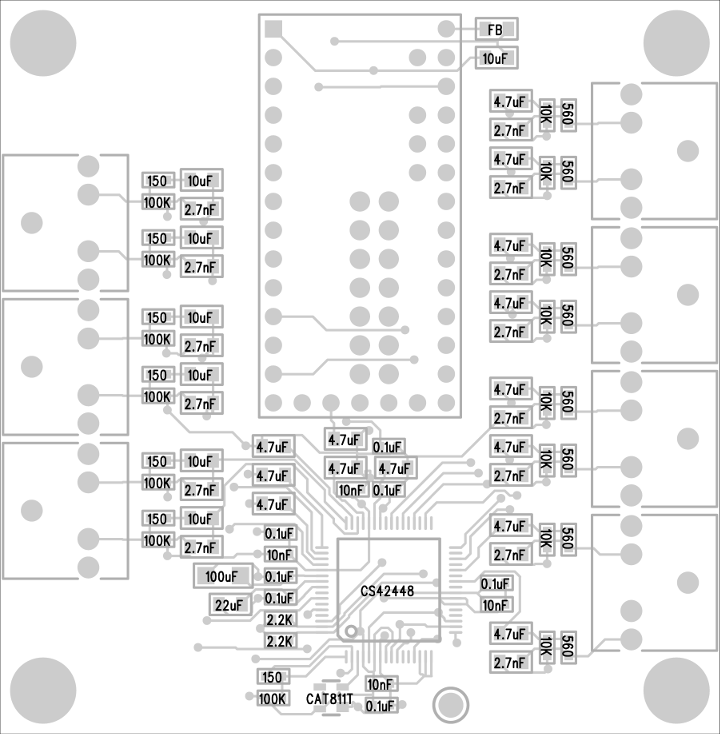 Is it possible to order a fully populated CS42448 board from OSH park or someone on the forum like the Soldering Goddess? I'm a bit confused on how people are getting these completed boards ordered other than through private messaging. I have 0 experience soldering SMD so I'm not sure I could make a working one myself! This thread has been most useful! i've been working on an audio project with teensy 3.6 for a few weeks now, developed my proof of concept using the audio shield and the 3.6 internal sd card (recording wav files into it) and all was well. Now i've upgraded to the CS42448 audio board, all audio is already working properly but the sd card is not saving any files and does not report any error! If i remove all the cs42448 related code and leave just my sd card code it works. I noticed that pins 11 and 13 are being used for both the cs42448 and internal sd card although it has the comment "// not actually used". although this change also worked in my sd card only code it still isn't working on my main project. Hi, I've just soldered a cs42448 board from OSH Park to be used with the teensy 3.6. I'm not sure though if the 5 pins which differ in position from v3.2 (reset, program, ground, 3.3v, vbat), should be connected to the board. It seems that the ground on the OSH board is connected anyway to the common for both v3.6 and v3.2 ground pin, but I've seen people here who connect this anyway. I think the same goes for the 3.3V pin. Do I need to take care of this, or will I fry the IC if I don't, and just hook up the 3.6 neglecting the 5 "horizontal" pins? @__ag how does your setup look like? Those 5 pins are ignorable generally. Indeed the GND and 3v3 pins are just duplicates, and the other 3 special purpose pins are only selectively needed as labelled. Given you have boards a quick tie of the GND and 3v3 from T_3.6 would tell for sure if the extra GND or 3v3 path helps - either the center pins - or the handy extra edge pins. Thanks for the tip! It seems it's not necessary to connect the extra GND ans 3v3. The noise and other problems I had (working for a few seconds and then dying) were because of my inexperience on soldering something this tiny. The flux I used is apparently conductive, and there was still some leftover after cleaning the board. It took me while as well to realize that only the even numbered in/outs of the TDM objects are valid, at least for v3.6 (0-10 for the ins and 0-14 for the outs). And now coding! I think I managed to solder the chip onto the board, hurray! Now, next task: solder all the little pieces too. Now I wondered: how to recognize the orientation of the capacitors? I just inspected one of the 10uF capacitors. There is a circle going through one of the ends. Does this signify anything? The clearest placement diagram was this of course: https://www.pjrc.com/teensy/beta/cs42448_placement.png. The parts are all readable in the same directions. Yet I would guess the orientation on the left hand side should be the opposite from the right hand side? OK, I found an explanation that ceramic capacitors are not polarised. Did you resolve this (T3.6 SD card/cs42448 potential conflict on SPI pins)? I'm spooling up to maybe build that combo. ...I noticed that pins 11 and 13 are being used for both the cs42448 and internal sd card although it has the comment "// not actually used". I posted in these forums a while ago about doing something with TDM that may have spurred Paul to make his test boards (a lot of I/O in eurorack). Since my idea of what to do has changed a bit and I am only looking to do 4 in 4 out. I was wondering if there is any roadblock to using a WM8731 instead of the SGTL5000? I also had some performance uncertainty between TDM and quad I2S, am I right in thinking that quad I2S will require less of the processor? Going to doing some rather taxing things with reverb and granular, so any processor performance I can save would be great. Basically I have a desire to use 2 WM8731 instead of a CS42448 for a number of reasons: lower power requirement, lower part count, single ended, better understood in use case, and easier to manufacture. Cost is the same and audio performance should be similar. I still need to add the CAT811T to the circuit. I've used 4 stereo input channels instead of 3. Im not sure if the extra 2 input channels will be available in the TDM stream. Please feel free to suggest corrections and improvements. I can't see your images here, but I do see them on the github page. On your next post, any chance you can put PDF files here? PDF usually works best for quickly looking at schematics. 1: You have 4 copies of the ST_IN block on the main sheet, but there are only 3 stereo inputs on the PCB. 2: The ST_OUT circuit shows 470 ohm resistors, but the design uses 560. 3: CS42448 pin 1 is shown connected to GND. On the PCB, it goes to 2 resistors which are intended to allow configuring the address. 4: The AOUT- pins (25, 28, 29, 32, 33, 37, 38, 41) are shown connected to AGND. On the PCB, they are unconnected. 5: CS42448 pin 21 (AUX_SCLK) is shown connected to GND. That's probably correct, but on the PCB that pin is unconnected. 7: The 2nd output of ST_IN3 is shown connected to pin 57. On the PCB, it connects to pin 60. Pins 57 & 59 are unconnected. 8: As you mentioned, the reset chip is missing. There may be other issues, but those are the things I see from a quick comparison with the PCB layout.